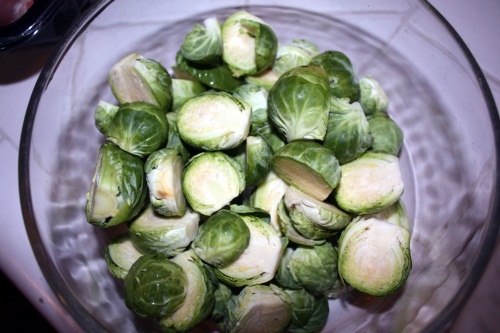 I never understand why the brussels sprout gets such a bad rep. Perhaps people have been turned off by a badly cooked sprout – one that has been boiled until dull green and mushy. I find this to be a travesty. The brussels sprout is a delight! It is versatile and can complement almost any cuisine. 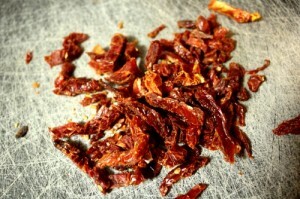 It is delicious whole, halved or shredded. Its flavor blooms when roasted, sautéed or blanched. Brussels sprouts are also an excellent source of Vitamin C, Vitamin K, fiber and antioxidants. So why do so many people detest this wonderful vegetable? I believe it’s simply because they’ve never had it cooked correctly. 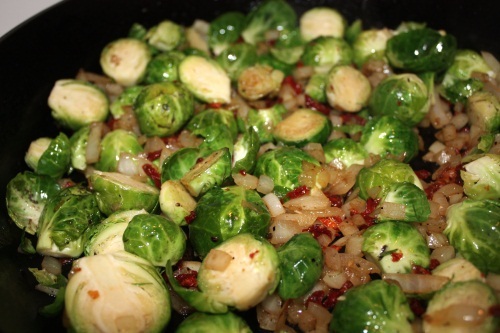 The key to cooking brussels sprouts is not to overcook them when blanching or sautéing. They should only be cooked to the point where they still retain their bright green color. I encourage you to open your heart and your kitchen and experiment with these cute little veggies! This recipe is a simple twist on sautéed brussels. The sun-dried tomatoes and basil add a sweet contrast to the mild bitterness of the sprouts. Try it with a little crisped prosciutto mixed in for a salty kick! Heat a large heavy bottomed skillet over medium heat (I used a cast iron skillet.) 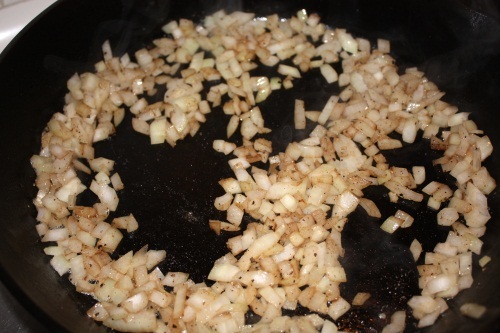 Sauté the onions and garlic in the olive oil until just softened. 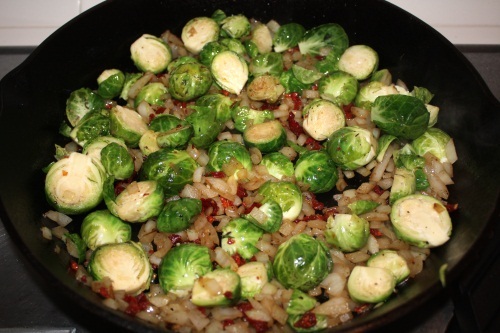 Add the brussels sprouts, sun-dried tomatoes, basil, salt and pepper and continue cooking, stirring occasionally, until the sprouts are fork tender. Serve immediately. Agreed! Cooked right, they actually have a delightful flavor. I like the roasted too. Brussel sprouts are cute and delicious, you’re right, Barb!! Down south I have had them with a white sauce. They’re sweetening up in my garden right now. Thanks for the tasty post. Barbara, It does seem like brussel sprouts has a bad reputation with a lot of people. One thing that I can’t stand is over cooked mushy brussel sprouts! Hopefully people will experiment more with healthy veggies that they do not like. This recipe sounds so delicious….can’t wait to try it. I love roasted Brussels sprouts. But your recipe looks wonderful, too. I don’t know if my aging digestive system could handle the garlic and onions Can I have just one little bite?